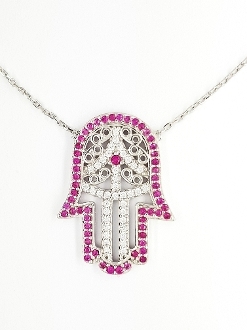 Feel empowered by wearing this Sterling Silver Ruby Red Hamsa Hand necklace. The Hamsa Hand is often worn to vanish the presence of any negative energy that may surround you. This necklace is adjustable in length and features a beautiful Hamsa Hand with handset white and ruby red color cubic zirconia.